Want to run your own kitchen? You need more than a couple of cookbooks under your belt to break the big time. 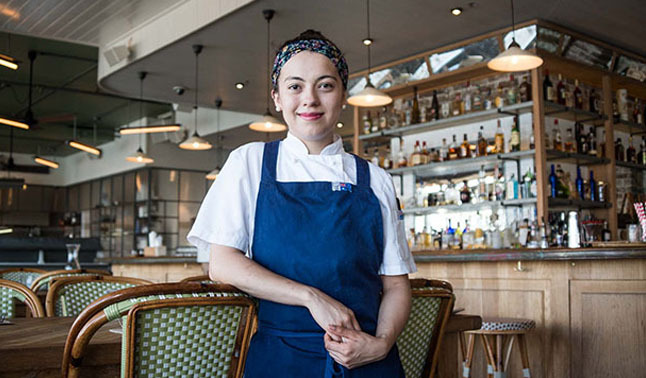 For Catalina Fuentes, junior sous chef at Manly’s Papi Chulo, getting a career in cooking off the ground comes down to three things: passion, practice, and perseverance. At age 22, Catalina has already reached one of the more senior positions in an established professional kitchen, so is somewhat of an authority, when it comes to kick-starting this particular career. Unrelenting enthusiasts in exactly what makes a kitchen tick, we met up with Catalina to get a few tips on how young cooks can become good chefs. Every culinary dream has to start somewhere, so it’s important to nail down that passion for food, and figure out a game plan. For Catalina, following her occupational instincts meant relocating from her native Colombia after high school. “One of my best friends, we both really liked baking, and I really liked doing desserts when I was in high school, so I just thought… I want to be a pastry chef, and I want to study cooking.” She enrolled at William Blue at Torrens University, where she studied Culinary Management. Just like with any trade, repetition of an exercise creates a neural shortcut that allows that exercise to be completed to a high standard with minimal conscious brain effort. The same rules apply to cooking, and they apply to everyone. For Catalina, the practice doesn’t seem like such a burden. “Cooking for me is not only a job. It’s not something that I wake up and go, ‘I don’t want to go to work.’ It’s something that makes me happy.” Hot tip? Follow the old ‘do what you love and love what you do’ mantra and hitting snooze on that alarm will be a thing of the past. Go out and try food? You’re really twisting my arm, here. Source: Concrete Playground. Click here to view.